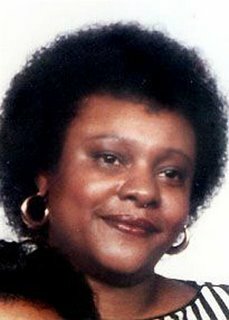 This photo shows the face of Edna L. Stevens, who perished on 9/11 at the Pentagon. Before you scroll down for details about her, please take a moment to look at her beautiful face. Take a good, long look! I hope that you took that minute. Now, scroll down. Edna L. Stephens, 53, liked to cook, bowl and sing in the choir at Varick Memorial AME Zion Church in Northeast Washington. With 34 years at the Pentagon, the civilian budget analyst for the Army looked forward to retiring next year and moving back to her home town, Gainesville, Ga.
And her family, including her father, son and most of her eight brothers and sisters, anticipated the day she would return to the Atlanta suburb. "Whenever she came home, it was always a happy time," said her sister, Eunice Holcomb, from Stephens's Capitol Heights home. "When she left, we didn't stop laughing." Stephens was on the Department of Defense list of those unaccounted for after the attack at the Pentagon. Soon after graduating from high school, Stephens moved to the Washington area and began her job at the Pentagon. About three years ago, she thought about retiring, but instead, Stephens bought her first home and pushed off thoughts of retirement to the future. Holcomb, 45, said she'll miss confiding in Stephens, the second-oldest of the nine siblings, who was like a "family guidance counselor." "I won't see her and listen to her and talk to her about things that I can't decide on," Holcomb said. "She was a focal point of guidance for us all. Even though she was far away, we always talked to her." Stephens's only child, Torrass Allen, a Gainesville High School music teacher, said that while his mother was working at the Pentagon, she attended the University of the District of Columbia. "She was serious a lot of the time," said Allen, 33. "But she knew how to have fun. She would say what was on her mind. She liked to play cards and be with her friends." And Stephens liked to smile. "Right now, I think the main thing I'll miss is her smile not being here anymore," Holcomb said. "One of her friends gave me some consolation when she saw me and said, 'There's her smile.' No one had ever said that to me before." Click HERE to add a flower of tribute to Edna's page. Please take time to observe a moment of silence for Edna L. Stevens, our fellow American. Edna, you and I are sisters in Christ. I'll see on the other side of the river! Until that time, I will never forget you. "And the Debate Goes On"